Hopefully this will take some of the grunt work out of those late-night papers. 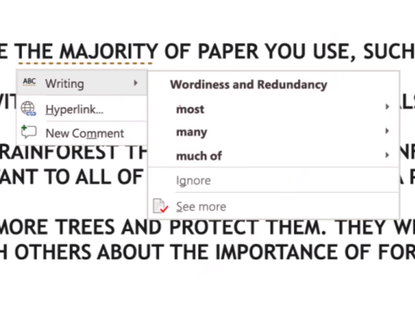 For years, Microsoft Word has included spell checking, grammar checking, and bibliography tools to help students and others polish their writing skills. You can think of the new Editor and Researcher tools as supercharged versions of what’s already there. Both capabilities will only be available to those who subscribe to Office 365, Microsoft’s subscription service, however. The Researcher tool should be available today to subscribers, or after your Office 365 suite completes its most recent update. Editor will arrive this fall, Microsoft said. The July updates also include new Outlook capabilities. Both tools are “cloud-powered intelligent services in Office apps designed to save you time and produce better results,” Kirk Koenigsbauer, the corporate vice president for Office 365 client applications, wrote in a blog post. An example of Microsoft Researcher for Word in action. Why this matters: Editor and especially Researcher are certainly innovations that educators are going to have to pay attention to. It certainly seems that Reseacher will eliminate some of the “grunt work” from a college paper, quickly finding, inserting, and citing published work. Ideally, that would leave more time for the student to develop the argument rather than digging up research to support his or her thesis. You may have already run into elements of Researcher inside two other applications: Sway makes it easy for you to find and insert publicly available art into your presentations, and Word 2016 already includes a “Smart Lookup” feature that essentially conducts a Bing search for a given term, without you having to leave your document. Search for “Yosemite,” for example, and Smart Lookup provides images, a Wikipedia entry, and a more general web search within a sidebar. It’s this last bit that Researcher builds on. According to a video demonstration of the feature, Researcher expands the sources available to you, but also allows you to drill down into them without leaving Word. 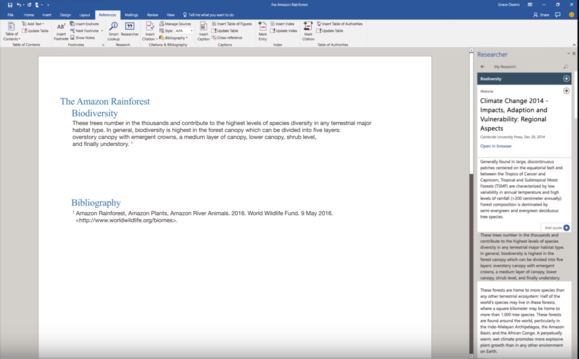 In the video, Microsoft shows how users could explore a topic such as “rainforest,” and then go deeper for related topics, like "biodiversity." A key feature is that users can pull quotes from sources like academic papers, and Word will automatically add a footnote with the correct citation—always a plus for a student cranking away on a last-minute paper. Editor, meanwhile, takes the spelling checker and grammar checker that’s common to Word and adds a new feature to “tighten” your writing. Microsoft said it will apply its cloud intelligence to bring more clarity to your writing—for example, replacing wordy phrases with more concise alternatives. Those suggestions will be highlighted with a gold squiggle underline, versus the red squiggle Word uses for a misspelled word. Office 365 will also add a nifty zoom feature for PowerPoint, which looks similar to what Prezi has offered: Instead of presenting slides one after the other, a presenter can provide a summary slide that can be “zoomed” into. Essentially, it allows presenters to provide “thumbnails” of forthcoming slides inside of a summary slide, treating individual slides more like hyperlinks to different web pages. PowerPoint Zoom is now available to those on the Office Insider program, Microsoft said.